So the UK General Election (2015) looms, and without a doubt the NHS and care system are at the heart of many people’s concerns. What are the parties policies? Conservatives: pledge to increase NHS spending in England by at least £8bn above inflation over the next five years, to ensure seven-day access to GPs by 2020 and same day appointments for over-75s whenever needed, integrated health and social care and improved access to mental health treatments. Labour: pledging an extra £2.5bn funding for the NHS, to pay for 20,000 more nurses, 3,000 midwives and 8,000 GPs, to repeal the Health and Social Care Act and cap the amount of profit private firms can make from the NHS at 5%, to integrate NHS health care and social care and end 15 minute care visits. Lib Dems: pledging to increase NHS funding in real terms by at least £8bn a year by 2020, starting with an extra £1bn a year until 2018, to integrate health and social care budgets, to allocate and extra £3.5bn for mental health (including £1.25bn for children and teenagers and £250m for pregnant women and new mums with depression). So what’s to made of it all? 2. written up an election debate: https://www.mencap.org.uk/news/article/political-parties-quizzed-welfare-election-promises. Age UK has similarly sought pledges, as has The Alzheimers Society but politicians haven’t cuddled up for the silver vote quite as strongly, it seems, on the social care front, although there’s been a lot of pension pledges (although I do realise that not everyone with Alzheimers is older, but hope you’ll bear with me for the purposes of this discussion). The NSPCC has called on us all to put children at the heart of the election: http://www.nspcc.org.uk/fighting-for-childhood/campaigns/tell-election-candidates-childs-story/, although most electioneering around children’ws issues appears to have backfired for politicians. 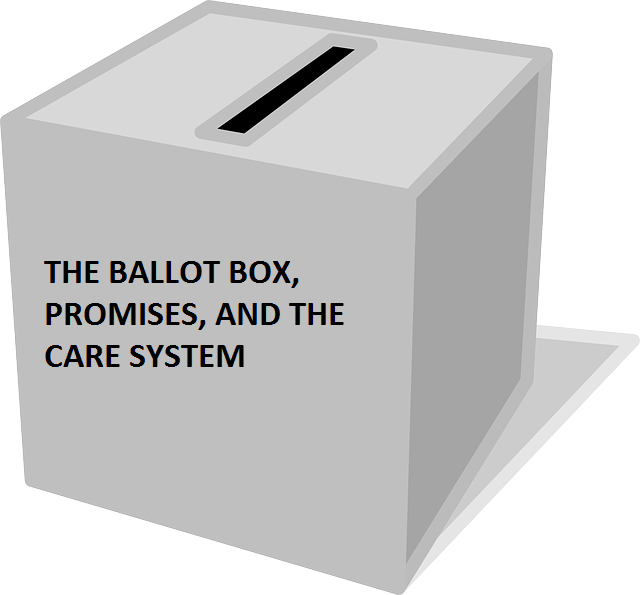 Whichever way you vote, our care system is at the heart of the agenda. It matters. It affects lives, It affects our pockets. And for The Care Locker it’s our life blood.